I just couldn’t stop myself. A rare step by step. After this weekend’s food-fest, I needed something for dinner that would live up to my (now) very high standards. But I equally needed something moderately healthy, as a result of this weekend’s food-fest. While brainstorming, burgergal asked me what ingredient I wanted to use. Recently, when I think healthy, I think quinoa. But a big plate of quinoa wasn’t exactly going to cut it. I also needed some ramps in there (obviously). What else… some mushrooms maybe? That would be good, really good. But for some reason, and this never happens, I wanted red meat, not in the form of a hamburger. I wanted sirloin. Beefy, chewy sirloin. Putting together the building blocks in my head, I settled on a mish-mosh of ingredients that I thought would work together: mushroom and ramp quinoa with seared sirloin and pickled ramps. I know, I know, I just re-listed everything that I wrote above. But the combination was so tasty that I decided I had to give the gift to you, the readers. I started out by putting a quick marinade together: a couple of tablespoons of soy sauce, about a teaspoon of sugar, three ramp leaves, cut into strips, minced garlic, rice wine vinegar, a teaspoon of sesame oil, a teaspoon of vegetable oil, and a few cracks of pepper. I had bought a really cheap piece of top sirloin for about two bucks and cut it into some thin pieces, like you’d use for a cheesesteak. I tossed them in the marinade and let them hang out for about an hour while I went to the gym to get my Spin on (I’m addicted). I came back and put a 1/2 cup of quinoa on the stove with a cup of water and some ramp leaves (sensing a trend?). 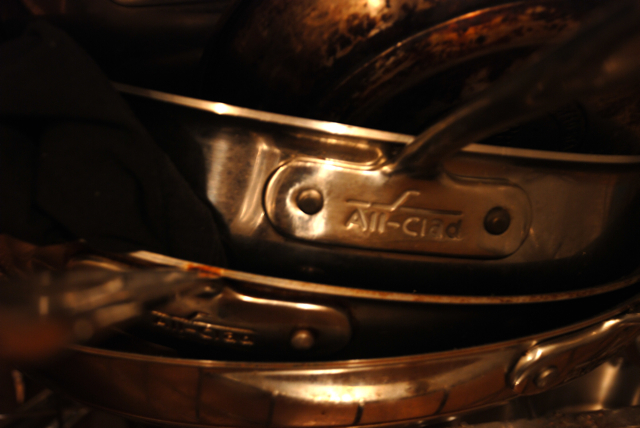 Once it came to the boil, I reduced the heat and covered it. Quinoa, done. Meanwhile, I cleaned about a cup of mushrooms… I went with a mix of shiitake and cremini. I also diced up another clove of garlic and did a chiffonade of ramp leaves. That was pretty much it– the rest was just assembly. I fired up the wok until it was scorching hot, and threw in the beef. After it was nice and browned up, I took it out and placed it aside. 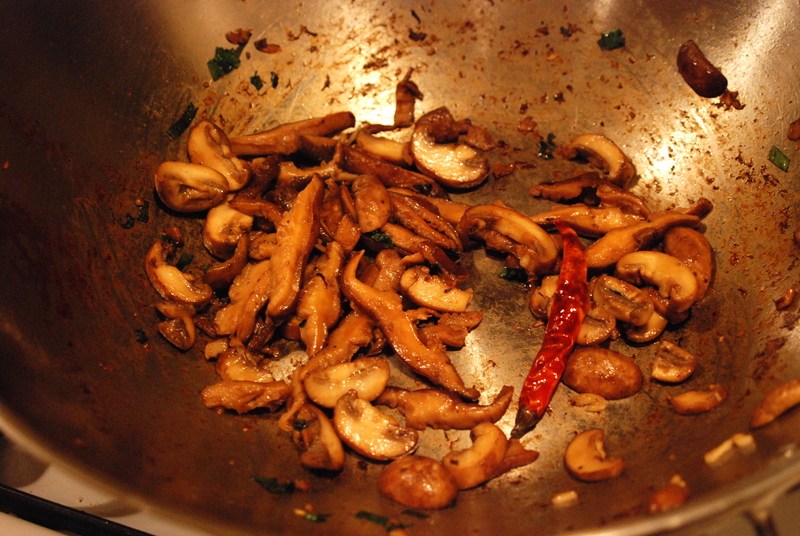 I added a little bit of fresh oil to the pan and added the mushrooms and sauteed those until they were cooked through. Just for some kicks, I threw a dried chili in there. Why not ,right? Tags: cooking, pickled ramps, quinoa, ramps, sirloin, stir fry. 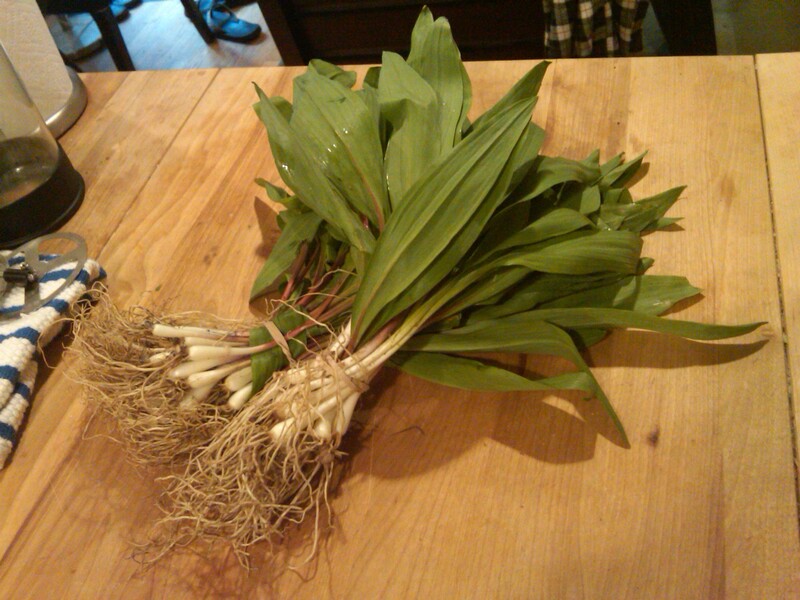 If Brillat-Savarin’s old adage is true, then consider me a ramp for the next month or so. For all of my readers on the East Coast, GO GET SOME. For those of you that are elsewhere, sorry, you are pretty much out of luck. Imagine the taste of a scallion, then add in the aroma of garlic and you’re just beginning to understand the flavor of the ramp. They have just arrived in NYC, so get to the farmer’s market early if you want to even have the opportunity to try them out. 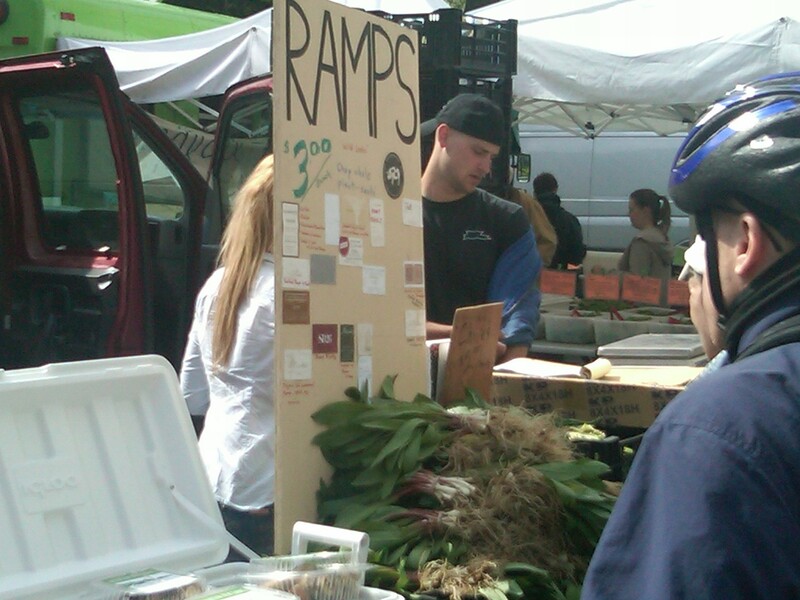 – Pickled ramps: So easy, but so tasty. On sandwiches, on burgers, on hot dogs, by themselves. – Pasta: Add a little extra garlic, sauté the bulbs up with some of the greens, add in the breadcrumbs for some texture, and toss with spaghetti. You’re singing. – Soups: Chiffonade some of the leaves and add to soup for a subtle aromatic, and add some sautéed bulbs for some extra flavor. I’m sure there are a million other things you can do with them, and all of them will be equally delicious. Do yourselves a favor and just get some. You’ll know what I’m talking about afterwards.